Leading industrialist Ratan Tata’s Twitter account was hacked and a “spurious” tweet with “malicious intent” was made. All the netizens were shocked with this tweet. Tata’s previous tweet on his twitter account is dated September 1, 2015. 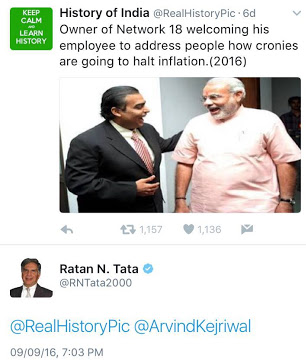 On Friday, a tweet by parody account @realhistorypic was shared by Tata’s account showed Reliance Industries Chief Mukesh Ambani and Prime Minister Narendra Modi together with the caption: Owner of Network 18 welcoming his employee to address people how (sic) cronies are going to halt inflation. 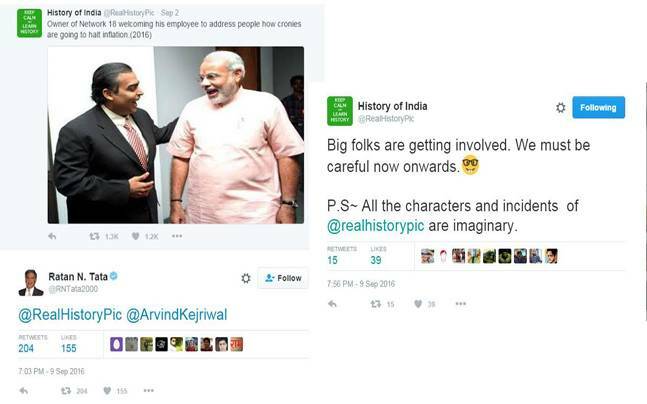 After the share by Tata, the @realhistorypic account responded to this with a guarded yet funny disclaimer: “Big folks are getting involved. We must be careful now onwards. “Shocked that my Twitter account was hacked yesterday and a spurious malicious was wrongly attributed to me. This spurious tweet has now been deleted and my Twitter account restored. I regret the inconvenience that this malicious and wrongful action may have caused,” he tweeted. Mr. Tata who is seldom onboard twittering despite having 6.13M followers has so far tweeted 119 times.